This year my focus has been on having more fun with my fitness... to stop taking myself so seriously; to stop getting wrapped up in online challenges that I find stressful, and to be HAPPIER about the activities and workouts I am doing. There are so many things that I really love to do, so why bother wasting time with all those that I don't? This also makes me a much happier person. What? 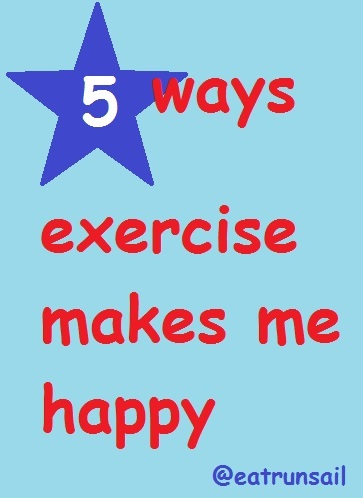 How does exercise make me happy? 1. It makes me feel better about myself. It gives me a boost of self confidence when I work to reach a particular goal, whether it be for distance or time or even a rep count. I feel more confident on my feet and more capable physically. 2. It is a mood enhancer. From a science perspective, exercise increases the level of endorphins secreted by the pituitary gland that boost mood, lower appetite and block pain. From a fun perspective, I love to be engaging in activities I think are enjoyable, whether it is participating in a particular sport or hiking outdoors on a lovely day. 3. It helps me sleep soundly. On days I run longer or workout more intensely I am physically tired and I sleep much more soundly and wake up feeling more refreshed and energized for the new day... which makes me more inclined to have another great workout. A lovely 'cycle' for sure. 4. It allows me to enjoy some treat foods occasionally. Yes, it's true. Exercise burns calories while you are doing it and causes an increase in calorie burn for a while after. It's all about the math. 5. It is an aid to getting the physical shape I want to be in. Lifting heavy things makes bigger muscles. Muscle is shapely and great looking. I am vain and admit that having visible muscles makes me happy. I know everyone has different reasons to work out. How does exercising help make you happy? I am with you on all counts! I do it for the sheer joy of it...and feeling great! All of the above. And also, as the mother of 2 teenagers, it's my thing. Me time. Love! All of this is so true for me, as well. I am always in a better mood on days when I get to workout - and I have more energy, too! I'm all about ALL of this! Thanks for this happy reminder! It definitely helps my mood and the phsyical effect make me feel more confident and awesome! I 100% agree with you on all of these, especially the point about it being a mood enhancer. It amazes me how 1 good workout can help get me out of a funky mood. I couldn't agree more with your points! I think those are all great reasons to exercise! So true for me as well! It also makes me feel like if I was in a tough situation when I needed to run away from something/someone, I could do it. Agreed on all accounts! Working out is such a mood booster for me. All great reasons! One of mine is that it challenges me and makes me push myself for those PRs, whether it's running or lifting. These are all awesome reasons! Working out boosts my moods and because I am such a moody person... I could always use the boost with my moods. I love exercising! It helps me relax after a long day at work. All great reasons - 2 and 3 are big ones for me. If I'm in a bad mood, I can always go to the gym and leave feeling better. And if I don't workout I'm a total insomniac! Great tips has been shared here on exercise and the benefits of doing it. Really a nice and useful blog shared here with us. Thanks and keep sharing more with us. Frozen Cherries... How I Love Them!